Google Chrome becomes the most popular and fastest web browser on Android. Recently, Google has removed the ability from users to disable suggested articles. Google’s android browser always displays suggested article on new tab and user can read them directly without any difficulty by one click. Now, Google chrome is doing some changes on web browser by which user can download that article and read them in offline mode. This feature will be rolled out very soon and it will be supported globally. Suggested articles available in Google Feed, Google News, Chrome’s new tab page, and sometime searching query on Google search results. Using this feature the web browser will be able to save pages offline automatically based on your location. This feature is running on beta stage and rolled out for beta users. According to Android Police, they have found suggested articles card in Google Search results and it will be labeled as “More like this”. User can use this feature it will be displayed next to the address bar on android web browser. Users will have a new button by which they can save Google’s top stories from top rated site. They can download link by tapping on “More like this” button and sliding up various source’s similar stories from bottom. They can expand it to view all cards, tap on a particular card to open it after tap hold it to either open in a new tab or incognito mode then open in incognito tab. Android Police supposed that the button will start showing up in Google Chrome from its latest 70th version. 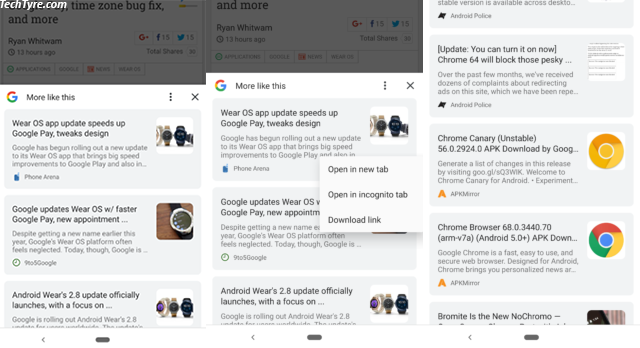 The latest Chrome developer update will be available chrome 70.0.0 version for user. User can enable this feature before launch or installing beta version by Chrome experimental flags which come under the “Contextual Suggestions” flag. User able to turn on this feature by enabling “chrome://flags/#enable-contextual-suggestions-bottom-sheet” and “chrome://flags/#enable-contextual-suggestions-button flags”. You have to search this URL into your address bar. You will see the default selected option on screen. You just need to select enable option and Re-launch the chrome mobile browser. By turning on this UI flag may not affect properly in mobile device. You must have to wait for official version release. If you want to experience this feature without waiting then user can install its beta version from Google Chrome Canary or Google Chrome Developer from Google play store.